The ONLY publication devoted exclusively to helping you create, build, and maintain a home-based business using your micro-system. SUBSCRIBE NOW to what may be the most important publication in YOUR FUTURE! 2115-M Bernard Avenue • Nashville, TN 37212 Visa and Mastercard welcome. Send account number and expiration date. TRS 80 is a Registered Trademark, Tandy Corp. Prices Subject to Change Without Notice rectly enter only those items which are applicable. A detailed and numbered input sheet helps organize data and reduces input time. When data entry is complete the program does all calculations and prints a summary of the entire return including taxable income, total credits, regular tax, income averaging tax, minimum taxes and payment due or refund. The Supertax II system ($27.50) makes all the calculations made by the Supertax I program and prints the tax return for you. It prints pages one and two, Schedules A, B and G and Form 3468 on tractor feed forms. The Supertax II system is a two-disk package which includes the Supertax I and II programs. The Supertax III system ($32.50) is also a two-disk package which includes Supertax I and II and also a program to calculate and print IRS Form 1040 Schedule C. The package also features a stand-alone depreciation program which calculates depreciation under the old depreciation rules (prior to 1981) and the new required ACRS rules. The programs run on the Models I, II, III and 16. For more information contact Rockware Data Corp., P.O. Box 1493, Piano, TX 75074, (214) 596-0588.
provide clear, machine-specific examples to help the programmer learn faster and work with more accuracy. Written in workbook format, author Eduard J. Desautels shares his expertise and VisiCalc programming knowledge and presents it in easy to understand, step-by-step directions, leading the programmer toward total VisiCalc programming confidence. 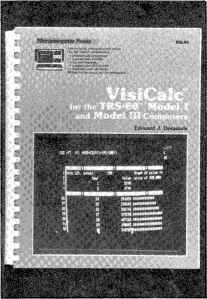 VisiCalc for the TRS-80 Model II and 16 Computers and VisiCalc for the TRS-80 Model I and III Computers sell for $16.95 each. To further enhance the guidebooks, Desautels has prepared disks containing several electronic worksheets. 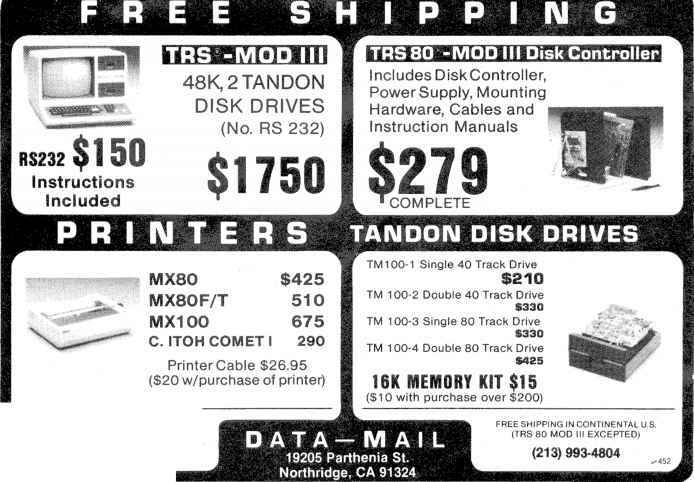 These disks are available for the Models II and III for $39.95 each. However, if you purchase a VisiCalc book and disk together the price is $49.95 for both. For more information contact Wm. C. Brown Co. Publishers, 2460 Kerper Blvd., Dubuque, IA 52001. The Model III Host program accepts variable length Cobol source files from your Model II and creates Model III Cobol source files in Cedit format. To upload your Model II files to the Model III use the terminal program which accompanies Model II TRSDOS. 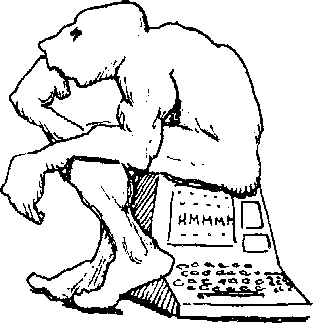 Host puts the Cobol source files in ASCII format required by the Model III Cobol editor. Host runs at 9600 baud for rapid data transmission. Priced at $34.95, it is available from Absecon Software Associates, 550 Fourth St., Absecon, NJ 08201, (609) 646-9322. The MicroGANTT projects planning system is now available for Model II computers running CP/M. It uses critical path method (CPM) techniques to determine task dependencies and project completion dates. The user creates a project by defining tasks and task dependencies and by assigning costs. The program immediately displays a Gantt chart which gives a graphic representation of the project. Tasks can be displayed on a time scale of days, weeks, months, quarters or years. The time scale of the charts can be varied at any time to present more or less detail. The Address Factory, a mailing list program for the Color Computer, is perfect for club newsletters, church mailings, business customer lists, and personal party lists. It records name, address, city-state, zip, and a special code of 27 characters for each person on your mailing list. You can add or delete names or change any information easily from your keyboard. The program prints mailing labels or a listing of all or any selected subset of your names. It sorts the names by zip code or special code. This product, accompanied by an instruction manual, is available on cassette ($17.95) or disk ($22.95) and requires 32K of memory. A printer is required for printing reports. For more information contact Computerware, Box 668,4403 Manchester Ave., Encinitas, CA 92024, (714) 436-3512. You are the Starship Chameleon, a special intergalactic vessel with the assignment of protecting the planet below from the aerial attack of enemy invaders. You have the unique capability to change color at the push of a button in order to destroy the on-coming super bombs and anti-matter bombs that have been launched by the enemy Gabolatoks above. But watch out for the semi-intelligent aerial bombs! They home in on your every move, seeking to destroy you! This fast moving, skill and strategy game can be played at nine skill levels. It is available on cassette ($24.95) or disk ($29.95) and requires 16K of memory. For more information contact Computerware, Box 668,4403 Manchester Ave., Encinitas, CA 92024, (714) 436-3512.